Bird's Eye Map Boston to St. John, N.B. Showing Steamboat Route and Points of interest. An attractive and uncommon c. 1900 bird's eye view map of New England, by the Boston map publisher George H. Walker. Printed with a multicolor lithograph process, Walker's view covers all of New England, from Cape Code, including Buzzard's Bay and Nantucket Sound northwards past Boston Harbor, Portland, and Maine, to the Maritime Provinces, the Bay of Fundy and New Brunswick. It includes the Canadian cities of St. John, Annapolis, Digby, Yarmouth, and Halifax as well as the U.S. cities of Bangor Maine, Penobscot, Portland, and Portsmouth, and many more. The map extends inland as far as Lake Champlain, including all of Vermont, New Hampshire, Maine and Massachusetts, as well as parts of Connecticut and Rhode Island. Inland cities identified include Providence, Hartford, Springfield Worcester, Concord, Bangor, Rutland, Montpelier, Burlington, and St. Albans. 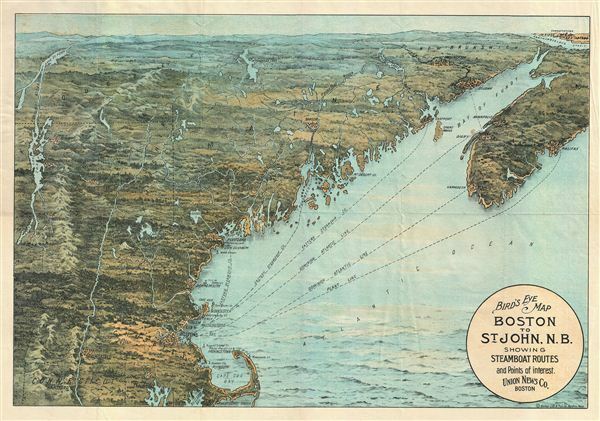 Steamship lines between Boston and various New England and Canadian cities are especially noted. Walker is better known for his similar view maps of Boston Harbor - the present example is thus somewhat out of his focus area and very scarce. George H. Walker (January 4, 1852 - 19??) was a Boston based publisher of books, views, and maps active in the late 19th and early 20th centuries. Walker started his life as a dry goods merchant but developed an active interest in publishing during the early 1870s. Walker began publishing in 1878 when he partnered with an unknown New York Firm. Two years later, Walker brought the operation in house by partnering with his brother , Oscar W. Walker, in the opening of a lithography studio at 81 Milk Street, Boston. Shortly thereafter the firm expanded to new offices at 160 Tremont Street, Boston. The Walker brothers produced a large corpus of works, most of which focused on travel and tourism in New England. Walker also established the Walker-Gordon Milk Laboratory. This interesting investment was based on the premise that infant deaths could be avoided by providing higher quality milk. The company eventually became a great success, producing a high quality cow milk that closely resembled human breast milk. In the process the Walker-Gordon laboratory developed many of the dairy health standards that are still with us today. Very good. Some minor wear and verso reinforcement along original fold lines - especially at fold intersections. Folds into original cardboard binder.